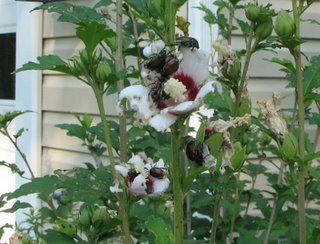 We are plagued with Japanese Beetles every year and they take over our Rose of Sharon bushes hardly allowing them to bloom since they eat the buds. One year I picked them off and put them in water and felt so bad about it. Instinct told me that something could possibly benefit by leaving them. We now leave them. The bushes are not good to look at and certainly not nice to be around. JB's hang around for 4-6 weeks with an interest in about 300 species of plants. Fortunately for us, they seem to congregate mainly on the Rose of Sharons. Some birds love to eat Japanese beetle, so attract them to your landscape with birdbaths, feeders and nesting boxes that are nearby where you have beetle problems. Don’t chase away starlings! 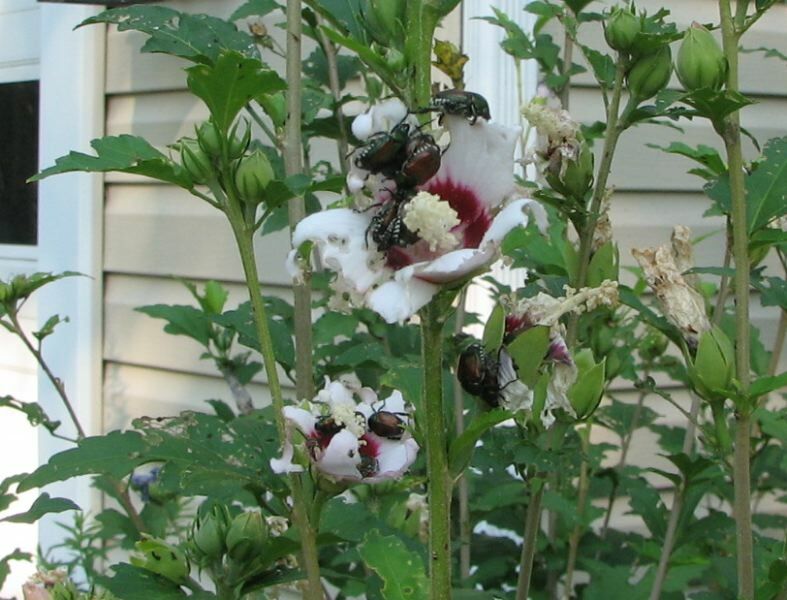 These birds may be considered pests, but again, they have a great purpose when it comes to Japanese beetles. They eat the adult beetles and the grubs in the ground. Another great natural enemy is the Spring Tiphia wasp, which was imported into America from China to control the beetles. The female wasp goes into the soil and lays her eggs right on Japanese beetle grubs, killing up to 85 percent of the grubs in a lawn. Sounds way better than poisonous chemical insecticides! Plant forsythia, peonies, and firethorn to attract these beneficial wasps. After they are done feasting, they lay eggs that produce grubs that winter over and become beetles next year. There are many critters that dig these grubs up and eat them. Sometimes I find one while digging in the garden and I put it in the bird feeder as a juicy morsel for some fortunate bird. If you've got turf grasses, these guys will kill it. Fortunately we don't want a lot of grass since it doesn't serve much purpose for wildlife, so that's not been a concern. My friends and neighbors have tried sprays and the bags that you hang around the garden to collect them, but their bushes don't appear to look any better than ours during this time period. The beetles release a substance that attracts more beetles and these bags have that substance in them. However, I've read online at various places that the bags seem to attract more beetles than they collect, so they're mostly being promoted now by places that sell them. If you have a neighbor using one to attract the JB's then you'll definitely have them in your garden. Patience is something I get to practice while waiting for the beetles to have their fill and be finished with our bushes and then the bushes seem to bloom profusely. It seems that the beetles have given them determination to shine after the battle is over. Are Polar Bears Really In Trouble?